Another efficient multifunction printer from HP, the HP Photosmart 5515 combines the function of printer, scanner and copier into one compact design. The device best suits for home users as it produces high quality photos, copies and everyday documents from greeting cards to recipes. The HP Photosmart 5515 ink printer has a structured design measuring 17.2 x 5.8 x 12.8 inches. It delivers a resolution of 4,800 x 1,200 dpi for coloured papers and 1,200 x 6,00 for monochrome sheets. The device has a control panel with various input touch buttons. It supports eprint and Apple AirPrint. It works with a print speed of 11 ppm for black and white files and 7.5 ppm for colour files, respectively. The device weighs approx. 11.2 lbs and have two paper trays. The input tray can hold up to 80 sheets and, on the other hand, the capacity of output tray is 15 sheets. It produces everyday documents with laser quality texts. This multifunction HP Photosmart 5515 ink printer is perfect for the needs of home users to print everyday documents. Although its attractive design and easy to use touch panel adds up more to its competency with other printers. However, at the same, time it also lacks many advanced features such as eFax and ADF. How to solve the ink cartridge problem of HP Photosmart 5515 printer? 1. Try removing and reinserting the cartridges. Make sure the cartridges are installed in the correct slots. 2. If reinserting the cartridges does not work for you, try cleaning cartridge contacts this would solve the problem and will result in better prints. Wipe only the contacts with a dry swab or lint-free cloth. Be careful to touch only the contacts, and do not smear any of the ink or other debris elsewhere on the cartridge. 3. If your problem is still not resolved, try replacing HP Photosmart 5515 ink cartridges. Refer the user manual to replace the cartridges with the new one. Q. What sizes of paper does the HP Photosmart 5515 printer support? A. This printer can print on sizes such as 3.9 in x 11.8 in, 3.95 in x 5.9 in, 4.33 in x 8.66 in, 5.12 in x 7.1 in, A4 (8.25 in x 11.7 in), A5 (5.83 in x 8.25 in), A6 (4.13 in x 5.83 in), B5 (6.93 in x 9.83 in), C6 (4.5 in x 6.38 in). Q. When should I undertake cleaning of the printhead of the HP Photosmart 5515 printer? A. You should undertake the printhead cleaning of the printer from the printer display if print quality is unacceptable, and the problem is not low ink levels. For this process, you need to load full-size paper. An information page will be printed at the end of the process. Q. Only My Yellow ink cartridge has run out of ink. I do not want to buy a pack for all the colour cartridges. Do you offer any individual colour packs for HP Photosmart 5515 ink cartridges? A. Yes, we have compatible individual packs for all colours of HP Photosmart 5515 ink cartridges available on our website. Q. How many colours are available in HP Photosmart 5515 ink cartridges? A. HP Photosmart 5515 ink cartridges are available in the following four colours: Cyan, Magenta, Yellow and Black. Q. My original colour ink cartridges for this printer are still working but the original black cartridge has run out of ink. I am thinking of purchasing a compatible black ink cartridge from your website. Can I use both compatible and original HP Photosmart 5515 ink cartridges simultaneously at the time of printing? A. Yes, you can use our compatible black cartridge along with your original colour HP ink cartridges with this printer at the same time. You will not face any issues while printing. Q. What are the specifications of HP Photosmart 5515 printer? A. The HP Photosmart 5515 ink printer has a structured design measuring 17.2 x 5.8 x 12.8 inches. The device weighs approx. 11.2 lbs and have two paper trays. Q. I own a photography shop, for which I need a printer that produces best quality and borderless photo prints. Which would you recommend? A. 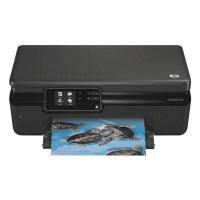 We would recommend you to buy HP Photosmart 5515 printer for your business. The printer is an appropriate option for printing photographs. Also, it supports borderless printing which makes it an ideal choice for users. Q. Under what conditions should I buy compatible HP Photosmart 5515 ink cartridges? A. At some point of time, the quality of the prints produced from your HP Photosmart 5515 printer might start getting faded. You might start getting low quality prints, which eventually affects your work. Under such circumstances, your ink cartridge needs replacement. Buying the compatible HP Photosmart 5515 ink cartridges means getting quality results at low cost, which would be beneficial for your business. You can buy your choice of compatible ink cartridge at Printerinkcartridges.ie. These cartridges are ideal for home customers to print photos, small projects and the good quality documents at an affordable price. Q. What is the purpose of different multipacks of HP Photosmart 5515 ink cartridges available at your site? And HP 364XL is ideal for offices. Q. Are these ink cartridges compatible with different HP printers? A. Yes, these ink cartridges are compatible HP Officejet 4620e, HP Officejet 4622e, HP Wireless, HP Deskjet 3520, HP Photosmart Premium C310 and many other printers. Q. What is the capacity of input tray and output tray of this printer? A. The input tray can hold upto 80 sheets and the output tray can hold upto 15 sheets. Q. Do I have to replace all the ink cartridges even if only one of them is running low or I replace only one of the HP Photosmart 5515 colour cartridge that has been run out? A. No, you don’t have to replace all the HP Photosmart 5515 ink cartridges at the time. You can replace only the ink cartridge that has been run out. The HP Photosmart 5515 printer makes use of the individual HP Photosmart 5515 ink cartridges. So you can replace each colour individually when they runs out. This also helps to reduce any ink wastage. Q. The printouts contain ink smear. How can I stop this? A. If ink smear appears on the printouts, then try to clean ink smear from the printer display. This process takes few minutes. A full-size plain paper is required to be loaded and will be moved to and fro during the cleaning process. Touch the right directional key from the home screen. Now touch the Setup icon. Now, touch Tools. After this, touch the down arrow to scroll through the options, and then touch Clean Ink Smear. The smear must be cleaned now. Q. Does XL cartridge can be used for the HP Photosmart 5515 printer? A. Yes, the printer supports the use of XL cartridges. These HP Photosmart 5515 ink cartridges have high capacity than standard cartridges and also offers more saving to the one having regular printing needs. Q. My printer is displaying an error message “The Indicated Ink Cartridges Must Be Replaced” even I have recently replaced the ink cartridge. How to solve this? A. This can be due to various reasons. You can try out following checks, if you have encounter this problem. Please refer the user manual for step by step instructions. Check if the cartridges are inserted correctly. You can remove and reinsert the cartridges. You must clean the cartridge contacts to ensure correct installation. You can restart the printer. Many of times, the problem gets solved by this. Q. At present I am using HP 364 cartridges in my HP Photosmart 5515 printer. Will these HP 364XL ink cartridges work with my HP 5515 printer or will they be too large for it? A. Yes, both of these 364 and 364 XL ink cartridges are compatible with your HP Photosmart 5515 printer model and work perfectly fine with it. The HP 364XL cartridges are just high capacity ink cartridges with high ink volume content as compared to the standard HP 364 cartridges. Q. My iPad just popped up with a message showing “low ink”. How would I know which HP Photosmart 5515 ink cartridge is low on ink or do I have to replace all the cartridges with the new ones? A. Your HP Photosmart 5515 printer should indicate for the low ink cartridge. You should consult the user manual on how to determine the low level ink cartridge for your printer. It would be unusual that all four cartridges run out of ink at the same time. Q. Can you please confirm that these HP Photosmart 5515 ink cartridges (HP 364xl) work with my HP Photosmart Plus B209a printer? A. Yes, these HP 364XL ink cartridges are compatible with your HP B209a printer model and work fine with it. Q. Do I have to replace all the cartridges for my HP Photosmart 5515 if any one of them run out of ink or I can replace the individual one? A. No, there is no need to replace all four cartridges for your HP 5515 printer model if any one of them run out of ink. You can individually replace the cartridge which has run out of ink. This is an extra benefit with the HP Photosmart 5515 printer which helps in reducing ink wastage. Q. Is it possible to use all XL cartridges in my printer, other than the black one? A. Yes, we have XL cartridges for all the colours and they can be used with the specified compatible printer models listed on the specific cartridge page. You should confirm the correct printer model number first and look for all the compatible high capacity ink cartridges with them. Q. There is no ink volume content listed on the cartridges I bought. Can you please tell me about the ink volume for these compatible high capacity HP Photosmart 5515 ink cartridges? Q. I am having issues while scanning with my HP Photosmart 5515 printer. Would you be able to help me out on this? A. Thanks for your question. Unfortunately, we are unable to provide the technical assistance regarding the printer. You can consult the provided user manual with the printer or you can directly contact the HP for the assistance. A. For your HP Photosmart 5515 printer to work it is necessary that they you have inserted all the individual cartridges i.e. Black, Cyan, Magenta and Yellow in their specific slots and they are locked in to the base. If there is any mis-matched cartridge in the printer it will not print. Q. What is the ink volume capacity for these original HP Photosmart 5515 ink cartridges?